Busy times in VineLand. The past month’s been a blur. Birthday celebrations. Passover and other family gatherings. Employment craziness for both myself and the Sweet Professor in Crime. A healthy dose of seasonal allergies. And, smack dab in the middle of it all, our 3rd Annual Kentucky Derby Shindig. We had a houseful for the First Saturday in May. Unless you’ve been living under a rock for the last couple of weeks, you’ve undoubtedly seen and heard about the breakdown of Eight Belles that followed the absolutely brilliant race run by Big Brown. A hush fell over our crowd, mirroring what happened at Churchill. I consider myself a slightly more than casual fan of thoroughbred racing, but I’m not going to wax poetic about the fallen filly or the pro/con of the humanity of the enterprise. (Although the statements by PETA about suspending Eight Belles’ jockey may have been some of the more idiotic things I’ve ever read…) I'll simply say that the whole thing was tragic -- and such a thing is heartbreaking whether it's on the biggest stage or in a maiden claiming. The horses themselves love to run, and that's enough for me. Our gathering found its second wind, thankfully. Much food was eaten, 3 ½ liters of my magic juleps were consumed by the partygoers, and everyone left with smiles on their faces at the end of the evening. Horse Play 2005 Rollicking Red -- An interesting California blend from White Rocket wines, an offshoot of Kendall-Jackson. This wine is made from almost equal parts cabernet sauvignon and merlot with a shot of syrah to add some fruit. The cabernet dominates initially with lots of tannin at first taste. In my opinion, you're better off letting it breathe for a bit right out of the gate. A very rich wine once it settles down, with plenty of blackberry and currant flavors and a strong, tannic finish -- almost like a cup coffee. Its richness calls for stews. At the aforementioned party, when I went to the burgoo I'd whipped up in the slow cooker, I took a break from the juleps to drink this wine and it meshed well. What's burgoo? For the uninitiated, it's a stew initially made from whatever was around the kitchen. (Or, as Vine Reader Miss Judy put it, "Whatever's on the road that morning...") I took a little more care with it. You can find this for $11-13. 14 Hands 2005 Red Wine -- If you're not familiar with horse terminology, a horses' height is measured in "hands," a unit equivalent to four inches or so. The name of the winery refers to the height of the wild horses that used to feed on the grasses in this part of rural Washington. The blend of grapes was very similar to the Horse Play, but the more northern latitudes where it was grown gave it a much softer, fruitier taste. The merlot was much stronger in the blend. That said, it still had some muscular plum and berry flavors, but the finish was smoother and less tannic. It worked wonderfully well with chocolate. $9-11. Tall Horse 2006 Sauvignon Blanc -- This South African sauvignon boasts a drawing of a giraffe on the label. So what if I'm taking liberties here -- since "Tall Horse" was the name of a giraffe given as a gift to the French by the Sultan of Egypt in the 1800s. Still, four legs -- hooves, and a general horse shape. Work with me, people. This wine is a very refreshing quaff. It has a bright nose of melon and grapefruit. The flavors of melons and lemons are very crisp. The finish is dry with more of the melon flavor. It'll run you $8-10, but is an excellent party wine. If you want to spend a little more, you might also check out some selections by Equus Run (for the Kentucky wine experience) or Wild Horse. 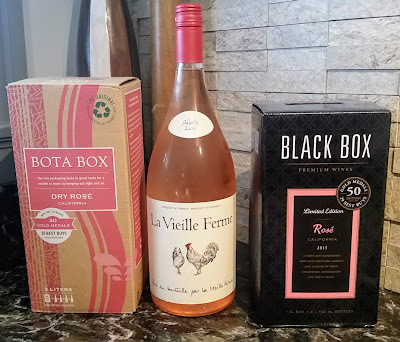 You could also nip over to the blogroll and click on Dark Horse (home of one of the tastiest zins that you’ll find) or Iron Horse,­ best known for sparkling wine but also purveyors of some other tasty selections like the Benchmark I just raved about. A quick post for the Vine's Greater Cincinnati readership. Over the last couple of weeks, the Sweet Partner in Crime and I have had a couple of especially celebratory eveningsThe good times of my birthday weekend at Natural Bridge were a bit delayed -- since my actual birthday fell a few days earlier. The SPinC took me for my birthday to Bistro JeanRo, one of the outstanding projects of local restaurateur Jean-Robert de Cavel. The evening at the Bistro was a tremendous success, from the birthday champagne toast at the start of the evening, through an absolutely tremendous duck in blood orange sauce for me and seared trout for the SPinC, finishing with the sumptuous chocolate mousse. Tonight, we headed to Chalk Food+Wine, a "casual fine dining" establishment in neighboring Covington which, on a drier weather evening would have been walkable. It's just next door to the Greenup Cafe, another of his restaurants that's one of our favorite brunch spots. We were celebrating the letter received last night informing the SPinC that she'd been promoted to full professor. (I'll be making a celebratory dinner...more on that later...) We'd actually planned to go there in March, but got socked in by a freak snowstorm and had to cancel our reservation. The meal was worth the wait. A quail egg "breakfasty" appetizer was followed by a Cornish game hen and pan cooked skate. We eschewed dessert, settling for a couple of glasses of wine and some dark chocolate on our front porch as we listened to the rain. I mention these establishments not just because they produce exceptionally good food, but in the spirit of the Naked Vine -- the selections are extremely reasonable in price. I've seen food of similar quality at triple the price I've seen here. The same goes for the wine list. Both places offer high end wines, but the bulk of both wine lists are very reasonable. While it's good to know that there are top shelf bottles available, the casual vibe of both places is enhanced by the knowledge that you can order a quality bottle of wine for a reasonable price that pairs exceptionally well with the excellent food. I had the opportunity to chat briefly with Chalk's sommelier, Bryant, this evening. He was extremely knowledgeable and approachable, and he's clearly put some thought into providing good pairings at a number of price points. They're planning to open up a retail wine operation at Chalk, so folks can take home what they get with dinner -- an excellent opportunity. So, merci, Jean-Robert. This neighbor of yours in Newport certainly appreciates your efforts.